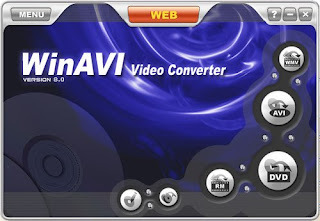 WinAVI Video Converter can be considered, without fear of error, the universal video converter to any format you want to process. Whether DivX, XVid (AVI, etc. ), VCD, SVCD, DVD, MPG of all kinds, ASF, WMV, RM, QuickTime MOV, and Flash SWF. From now on, you no longer see any more limited to a specific format. The operation is as simple as selecting the original file, and determine the destination folder. If you also want a little more, you can also select if you want some quality parameters of the final output file, such as the compression codec, size, audio quality or bitrate. To conclude this excellent application for conversion and editing video, WinAVI Video Converter includes a practical utility integrated recording, keep your videos to CD or DVD just compress. All videos can be preview in real time (while processing), and we can configure the program to complete its task when the computer shuts down automatically.